If you are a wholesale buyer or own a business in the gem & jewelry industry, you may be wondering how to get a wholesale pass or badge to enter the Tucson Gem Show. Some shows are open to the public, while others are only available to wholesale buyers. Each show at the Tucson Gem Show has a different set of procedures for receiving a wholesale pass, and most require registration and that you show proof of your wholesale qualifications. JOGS Show, click here to register for wholesale badges. Which Tucson Gem shows require a Wholesale Pass or Badge to enter? Not all shows require a wholesale pass. Some shows are wholesale only and require proof of business ownership to even enter the building. Other shows are a hybrid and allow both the public and wholesale to enter – but wholesale buyers often receive preferential treatment and special badges to indicate to exhibitors that they are shopping as a wholesale buyer. 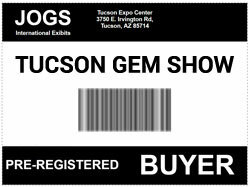 What documents do you require to receive a Wholesale Pass at the Tucson Gem Show? The most important documents you will need at most shows are a business/resale license or tax ID certificate. Shows that allow wholesale buyers require you to prove that you are an owner or employee of a legitimate business in the gem & jewelry industry. Each show has a different specific set of requirements, so check each individual show’s requirements before attending. If a buyer’s business/resale license or tax ID certificate does not reflect that your company is engaged in the gem and jewelry (or its related products) industry, or if their home state or country does not issue business/resale licenses, then they must provide copies of invoices for the purchase of gemstones, jewelry, precious metals or lapidary equipment made within the last year. This is a pretty common practice at most shows – so if you do not have a wholesale license, as long as you can prove you are in the industry with invoices, you should be accepted. Some shows are stricter than others, and others you can at least enter as a guest if not a true wholesale buyer. What advantages are there to having a Wholesale Pass? The biggest advantage to holding a wholesale pass at the Tucson Gem Show is that vendors and exhibitors will immediately know that they are dealing with a buyer who will be interested in purchasing in bulk, rather than “just looking” or buying gifts for themselves. It also saves vendors and buyers time, as the shows have already verified the buyers licenses and tax details at the door. For shows that are Wholesale-only, the biggest advantage is that you will be able to enter and shop from wholesale-focused vendors. Some shows also offer perks or special advantages that are only available to wholesale buyers, especially shows that have a hybrid public/wholesale model. These kinds of perks vary from show to show, so make sure to check what each show offers. Is it difficult to register as a wholesale buyer? NO. If you have all your documents available, registration can take as little as five minutes. Many shows allow online registration, which allows you to input your information early at your own pace, and saves you time at the show – no pen and paper required. The hardest part about registering as a wholesale buyer is having all your documentation. If you do not have access to your business/resale license, your tax ID certificate or other forms of proof, you will need to retrieve those before you can register for the shows. You will want to make sure those are also safely and securely packed into your luggage when you attend the shows – you may need to show them to the registration desk for each show you enter. How do you get a wholesale pass for the Tucson Gem Show? Some shows offer online wholesale registration, while others only allow registration at the door. It’s highly recommended to pre-register online for all wholesale shows you plan on attending that offer online registration – even saving a few minutes in Tucson can give you the time you need to see every exhibitor at a show. Registering for one show does not automatically register you for all shows – each show is independent, though they are all part of the greater Tucson Gem Show Showcase and often run during similar days.